NAPA (Neurological and Physical Abilitation) Center was founded in 2008 by Lynette LaScala, whose child had cerebral palsy. She travelled across the globe to seek inventive treatments which were not locally available. Her vision was to build a therapy center where families could experience the benefits of many therapies under one roof. The result—a clinic offering some of the most sought after and effective treatments for children with neurological disabilities. Good news for New England—exceeding your goals just got closer to home! NAPA Center will be opening their third clinic located in Boston in May of 2018! For updates, please visit www.napacenter.org/boston. The cornerstone of NAPA Center is its utilization of the intensive model of therapy. Under this model, children participate in 2-6 hours of therapy per day, 5 days a week, for 3 weeks. While the intensive model is not necessarily unique to NAPA Center, its interdisciplinary approach is. 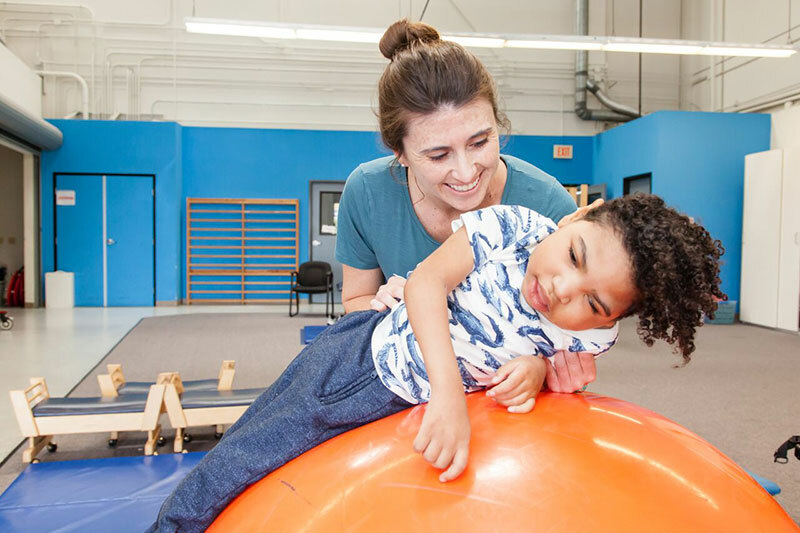 The staff includes specialized pediatric physical therapists, occupational therapists and speech therapists, who collaborate to implement individualized programs for each child. Utilizing the techniques described below, this combination of specialists allows for a whole-body developmental approach. NAPA Center therapists have been trained to utilize a variety of specialized treatment techniques as part of its intensive program including but not limited to: NeuroSuit®, Medek®, PROMPT®, VitalStim®, Spider Cage Therapy, Kinesiotaping®, Developmental Feeding Treatment, The Listening Program ® and Sensory Integration. 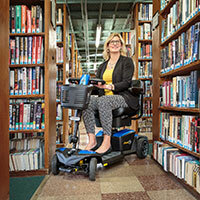 The Neurosuit® is a tool used to amplify the benefits of the intensive physical and occupational therapy treatment. It has three main purposes: it provides a load on the body to increase the body's upright response, it corrects for minor musculoskeletal misalignment and it provides increased proprioception to promote body awareness. It is worn in two-hour blocks of time. 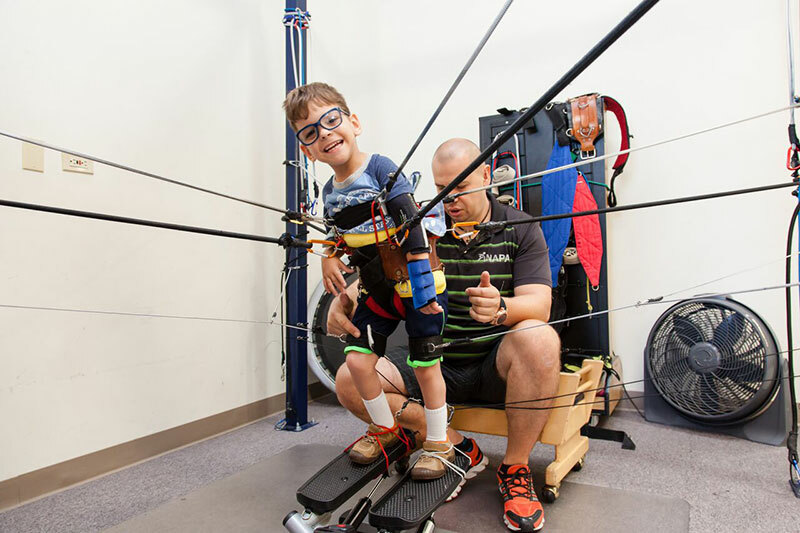 CME is a psychomotor treatment technique utilized by occupational and physical therapists to promote automatic postural and motor control in children using a specific set of exercises. It specifically is utilized to promote postural responses against gravity using increasingly distal support to facilitate progress towards gross motor milestones such as sitting, standing and walking. Utilizing a child-led Division of Responsibility feeding model, Developmental Feeding Treatment is provided for children who experience difficulty eating. From picky eating to g-tube transitions, occupational and speech therapists may utilize sensory, behavioral, and/or developmental techniques to provide your child with a safe environment to improve their eating skills. 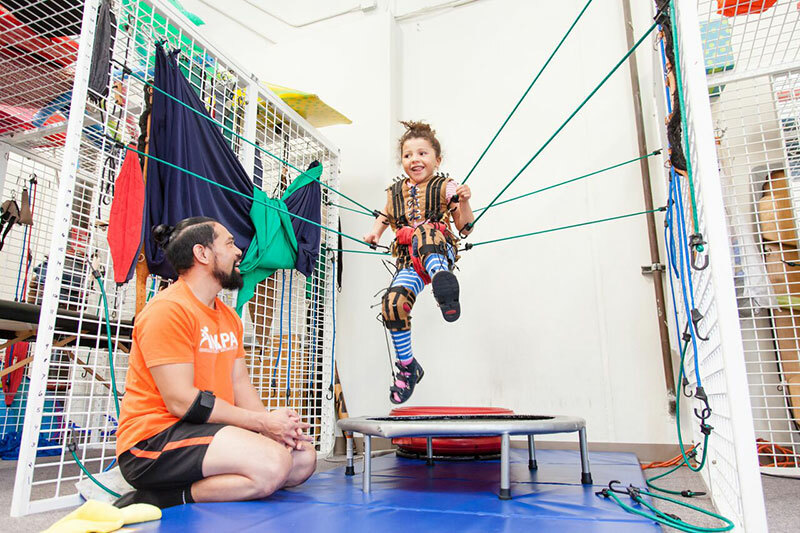 The Spider Cage is a metal frame which children are supported in using bungee cords to provide body-weight support. By eliminating some of the effects of gravity within this system, a physical therapist is able to promote increased independence with gross motor skills while simultaneously providing cues to facilitate correct movement patterns. Vitalstim® is a tool used by occupational and speech therapists in conjunction with feeding therapy for children with a diagnosis of dysphasia. It is a form of electrical stimulation with electrodes placed on the throat area. The purpose of Vitalstim® is to assist in strengthening and coordinating the swallow. The Listening Program® (TLP) is an auditory home program aimed at helping individuals who have difficulties with processing sound information. These children may be sensitive to sounds, distracted by sounds, or have difficulty following verbal directions. A child may demo TLP during an intensive before a therapist recommends it for home. Sensory integration is a treatment technique employed mainly by occupational therapists as part of occupational therapy treatment. Using knowledge about sensory integration, the therapist observes a child's behavior and chooses treatment activities to help address any sensory processing deficits they may present with. PROMPT® is a technique that a speech therapist may use as part of their therapy program. It consists of specific manual/tactile cues to elicit oral motor movements within the context of speech and sound production. Speech therapists utilize Augmentive and Adaptive Communication (AAC) to facilitate communication and language development in individuals who present with expressive language delay. Using low tech (picture cards, PECS, body movements, etc) or high tech (ipads, communication devices, switches, etc) strategies, the speech therapist facilitates communication through alternative channels. Since its inception, NAPA Center has helped thousands of children and families to overcome difficulties and improve their abilities and lifestyle. The support that families receive from one another in this communal environment is also life changing. For more information, visit www.napacenter.org or meet them in person at their The Intensive Model of Therapy: An Interdisciplinary Approach workshop at Abilities Expo Boston.